Technical Car Experts Answers everything you need: timing marks for 16 valve 2.5 ford ranger? timing marks for 16 valve 2.5 ford ranger? My timing belt broke completely. I installed a new one according to the manual. I put the key way at 12 oclock and lined up both arrows and diamonds on camshaft and oil pump sprockets. engine won't fire! When I turn engine over I can't get a compression stroke on #1 cylinder with spark plug out! when I look in #1 spark plug hole I see a valve sticking down -exhaust I think (which I think should actually be closed on #1 compression stroke). What could possibly be wrong. I tried reinstalling belt several times and no start! I figured out problem! The camshaft and secondary (oil pump) sprocket have two alignment marks each.........Book says nothing about that. I tried the other set of arrows and it fired right up! The books sure aren't very specific about things like this! line the camshaft diamonds up. line oil pump diamonds up.. line crankshaft diamonds up, then spin CRANKSHAFT clockwise half turn. install belt, and check compression.. worked for me! 2 marks are on the Cam pully a Triangle and a diamond , Align the Triangle with triangle an diamond with diamond on the back plastic timing cover the diamond mark is for the middle oil pump pully . 1. Rotate the engine so that No. 1 cylinder is at TDC on the compression stroke. Check that the timing marks are aligned on the camshaft and crankshaft pulleys. An access plug is provided in the cam belt cover so that the camshaft timing can be checked without removal of the cover or any other parts. Set the crankshaft to TDC by aligning the timing mark on the crank pulley with the TDC mark on the belt cover. Look through the access hole in the belt cover to make sure that the timing mark on the cam drive sprocket is lined up with the pointer on the inner belt cover. NOTE: Always turn the engine in the normal direction of rotation. 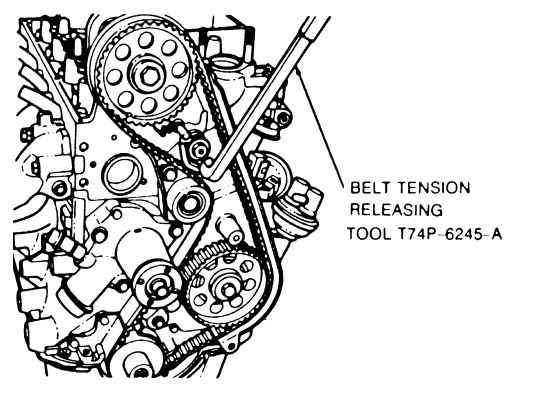 Backward rotation may cause the timing belt to jump time, due to the arrangement of the belt tensioner. 2. Drain cooling system. Remove the upper radiator hose as necessary. Remove the fan blade and water pump pulley bolts. 3. Loosen the alternator retaining bolts and remove the drive belt from the pulleys. Remove the water pump pulley. 4. Loosen and position the power steering pump mounting bracket and position it aside. 5. Remove the four timing belt outer cover retaining bolts and remove the cover. Remove the crankshaft pulley and belt guide. 6. Loosen the belt tensioner pulley assembly, then position a camshaft belt adjuster tool (T74P–6254–A or equivalent) on the tension spring rollpin and retract the belt tensioner away from the timing belt. Tighten the adjustment bolt to lock the tensioner in the retracted position. 7. Remove the timing belt. 8. Install the new belt over the crankshaft sprocket and then counterclockwise over the auxiliary and camshaft sprockets, making sure the lugs on the belt properly engage the sprocket teeth on the pulleys. Be careful not to rotate the pulleys when installing the belt. 9. Release the timing belt tensioner pulley, allowing the tensioner to take up the belt slack. If the spring does not have enough tension to move the roller against the belt (belt hangs loose), it might be necessary to manually push the roller against the belt and tighten the bolt. 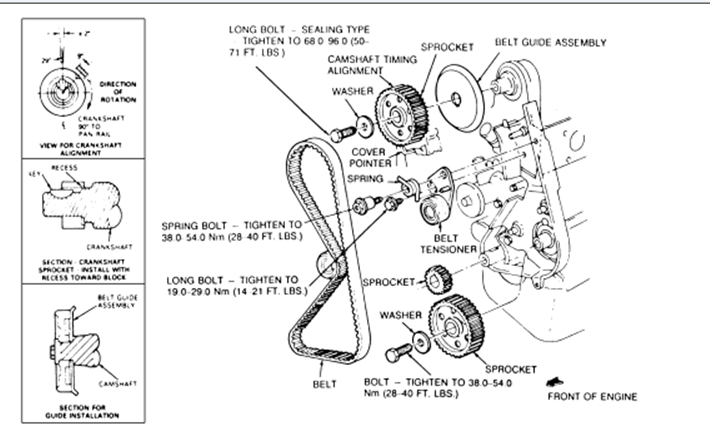 NOTE: The spring cannot be used to set belt tension; a wrench must be used on the tensioner assembly. 10. Rotate the crankshaft two complete turns by hand (in the normal direction of rotation) to remove the slack from the belt, then tighten the tensioner adjustment and pivot bolts to specifications. Refer to the necessary illustrations. Make sure the belt is seated properly on the pulleys and that the timing marks are still in alignment when No. 1 cylinder is again at TDC/compression. 11. Install the crankshaft pulley and belt guide. 12. Install the timing belt cover. 13. Install the water pump pulley and fan blades. Install upper radiator hose if necessary. Refill the cooling system. 14. Position the alternator and drive belts, then adjust and tighten it to specifications. 15. Start the engine and check the ignition timing. Adjust the timing, if necessary. Camshaft Timing Marks... after area was cleaned out. The engraved triangle on the belt guide very difficult to see. Lined up with triangle on inner belt cover.So take care mark dont get rubbed. Oil Sprocket Timing Marks. Again very hard to find even after area was cleaned. Crankshaft Timing Marks. Key Way at 12:00, Dot lined up with notch on belt guide. Crankshaft Position Sensor at left. Hard to remove even with the area clear. You could be getting interference (valve/pistion) or a valve getting slapped closed by an ignition/fire pulse (not common). The dot on the crank shaft lines up with the "notch" in the casting above and behind it. The auxiliary pulley has an arrow that lines up with an arrow on the back cover (you have to clear away the grime to see it), and the cam sprocket has an arrow that lines up with an arrow on the back cover (clean grime again). This is for a 2.5l. Rotate the engine so that No. 1 cylinder is at TDC on the compression stroke. Check that the timing marks are aligned on the camshaft and crankshaft pulleys. An access plug is provided in the cam belt cover so that the camshaft timing can be checked without removal of the cover or any other parts. Set the crankshaft to TDC by aligning the timing mark on the crank pulley with the TDC mark on the belt cover. Look through the access hole in the belt cover to make sure that the timing mark on the cam drive sprocket is lined up with the pointer on the inner belt cover. Always turn the engine in the normal direction of rotation. Backward rotation may cause the timing belt to jump time, due to the arrangement of the belt tensioner. Drain cooling system. Remove the upper radiator hose as necessary. Remove the fan blade and water pump pulley bolts. Loosen the alternator retaining bolts and remove the drive belt from the pulleys. Remove the water pump pulley. Loosen and position the power steering pump mounting bracket and position it aside. Remove the four timing belt outer cover retaining bolts and remove the cover. Remove the crankshaft pulley and belt guide. Loosen the belt tensioner pulley assembly, then position a camshaft belt adjuster tool (T74P-6254-A or equivalent) on the tension spring rollpin and retract the belt tensioner away from the timing belt. Tighten the adjustment bolt to lock the tensioner in the retracted position. 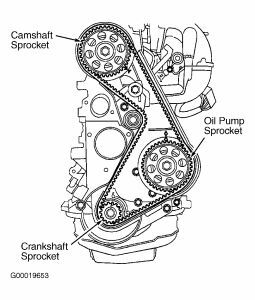 Install the new belt over the crankshaft sprocket and then counterclockwise over the auxiliary and camshaft sprockets, making sure the lugs on the belt properly engage the sprocket teeth on the pulleys. Be careful not to rotate the pulleys when installing the belt. Release the timing belt tensioner pulley, allowing the tensioner to take up the belt slack. If the spring does not have enough tension to move the roller against the belt (belt hangs loose), it might be necessary to manually push the roller against the belt and tighten the bolt. 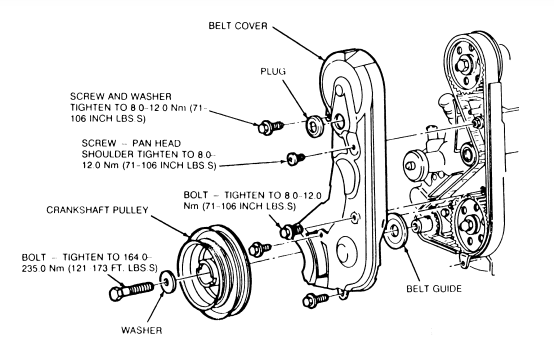 The spring cannot be used to set belt tension; a wrench must be used on the tensioner assembly. Rotate the crankshaft two complete turns by hand (in the normal direction of rotation) to remove the slack from the belt, then tighten the tensioner adjustment and pivot bolts to specifications. Refer to the necessary illustrations. Make sure the belt is seated properly on the pulleys and that the timing marks are still in alignment when No. 1 cylinder is again at TDC /compression. Install the crank shaft pulley and belt guide. Install the timing belt cover. Install the water pump pulley and fan blades. Install upper radiator hose if necessary. Refill the cooling system. Position the alternator and drive belts, then adjust and tighten it to specifications. Start the engine and check the ignition timing. Adjust the timing, if necessary. Labels: timing marks for 16 valve 2.5 ford ranger.